Introducing Opera Mini 8 – the biggest update for the Opera Mini mobile browser on iPhone and iPad to date. Available for free in the Apple App Store today, Opera Mini 8 will get you to anywhere on the web faster, cheaper and with a brand new native UI look for iOS 7. Opera Mini mode offers huge compression of web traffic, up to 90%, and data savings. In areas with poor coverage and tough network conditions Opera Mini saves both time and money. Opera Turbo mode saves slightly less data than Opera Mini mode, but offers better website compatibility, making it the ideal browsing mode for most users. Data savings off is a no-compression, straight-to-the-source option, that ensures maximum website compatibility. You can set the different modes as you see fit, e.g., disabling compression on your workplace’s high-speed Wi-Fi, using Opera Turbo with your regular data plan and Opera Mini when traveling abroad. Three options, all in a single web browser, all on your iOS device. Opera Mini has long been a must for people on the go, roaming to distant places of the world, and, with Opera Mini 8, it takes its place as the all-inclusive alternative web browser. On the surface, Opera Mini 8 for iOS has gone through a radical redesign and now sports a fully iOS 7 (and higher) compatible flat design, using transparency to visualize layers. All design elements have been completely re-built from the ground up, to fit in with iOS styling and the familiar user friendliness of Opera’s smartphone browsers. Don’t like the default looks of Opera Mini 8? Just pick another of the sleek themes available to make it feel more yours. Go, go, Speed Dial racer! From the Speed Dial page, you can either select one of several customizable Speed Dial entries to visit a favorite site, or, by swiping to the left, immediately get fresh content from the Discover feature, which lets you choose the content you want, from a long list of options. The Discover feature will then provide fresh content from a rich variety of high-quality news websites, blogs and more for a super-easy overview of what’s new on the web. Once you’ve selected an article and tapped it to read more, swipe left and right to read more articles tailored to your preferences. Managing open web sites is simpler than ever, with the new tab gallery. Opera Mini now shows every tab neatly stacked for a quick overview, so you can handle sites with simple gestures. Swipe left and right to quickly leaf through the open tabs, or swipe up on an open page to close it. Want some privacy? Just select “New Private Tab” from the menu, and you’re all set. You can even switch easily between your private and non-private tabs, keeping their open pages separate. Want to start the day with a clean slate in the browser? Select “Close All” to get that zen feeling of no open pages to worry about. The combined search and address bar means you can get search suggestions or go to a web address right away. The new QR reader is a nifty addition, as is the ability to share URLs via QR code. Easy editing of addresses and search terms using a slider means no more hunt-and-peck to put the cursor where you want it. The ability to switch search providers easily means more efficient searching. Want to check if that actor was in that movie with that other guy a few years ago? Just enter his name and select “IMDB” as the search option, to get the facts directly from IMDB. This works with providers such as Amazon, eBay and Wikipedia, too. 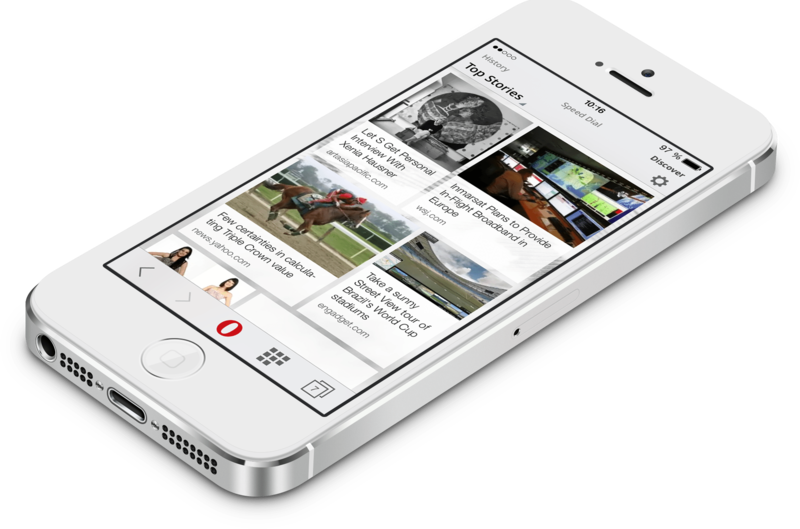 The Opera Mini 8 browser is available for free in the Apple App Store today. Samsung Launches First Foldable Phone, Galaxy Fold!